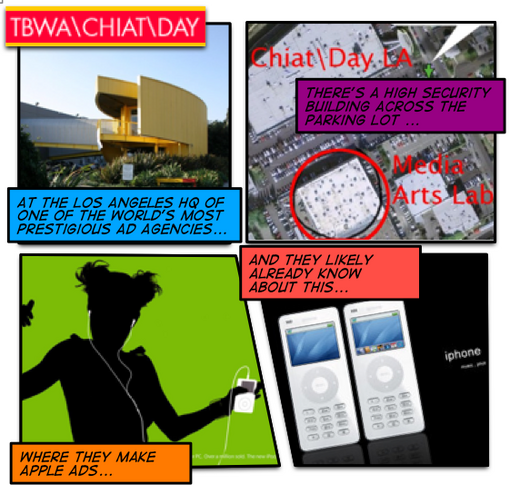 Even if you don't know anything about the advertising world, I guarantee you know the agency TBWA\Chiat\Day. They did the PS3 ads, and have done every Apple ad you can think of, including the iPod, Think Different, and 1984 ads. How does that stuff go unleaked? The agency has a separate building dedicated to Apple ads that even regular Chiat employees can't get into— The Media Arts Lab. Not many have seen the inside of the shop, but considering the other, main building is decked out with an old Nissan (they're a client) on the floor, a meeting room table made of surf boards, a bastketball court in the middle of a sea of cubicles, and a freeway billboard over the lunchroom. So, I have to wonder how rad the inside of the Apple building is. We'll likely never know. The creative staff that works on the project has never been connected to any leaked info, and access to the building is probably manned by a guard, 24/7. I do know for a fact that a fingerprint swipe is required for entry. I don't know where Chiat did their Apple ads before this building was put up, and I don't know if this was made on Steve's request. I don't know much about it, except the building was dubbed the Media Arts Lab in May of this year, although I suspect the building's been around longer than that.  Some audio website revealed that the studio has "three Final Cut edit bays, a Pro Tools HD surround studio and a complete machine room with the Apple Xsan fiber network at the hub." But who cares about the gear. Right now, I'm dreaming of a concept room with three dozen concept ads for the iPhone draped across a ginormous wall of longboards. Only those creative directors, the production people, and a handful of janitors know what's going on in there for sure.